Infection controls and universal precautions protect clients and staff alike. Everyone benefits from rigorous infection control — you, your dentist, and the dental team. The cornerstone in a good and safe dental practice is the element of trust. You should feel free to discuss this topic with Dr. Scalas and receive a straightforward answer. 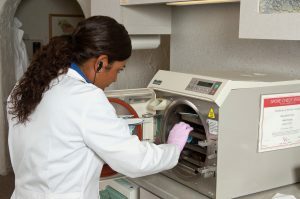 Dr. Scalas, Dr. Ikoma, and our entire team follow procedures recommended by several federal agencies: the Occupational Safety & Health Administration (OSHA), the Environmental Protection Agency (EPA) and the Centers for Disease Control (CDC).